Updated as news comes in from the blockhouses and jungles of the Ultramar. Another triumph for Spanish arms! - Well, maybe just for Spanish militaria and military history. The ¡Los Rayadillos! collection display took 1st. Place in the annual display competition against some other very nice displays. 2nd. Place went to a very fine display of identified WWI US Marine uniforms and headgear. Who would ever think that the Spanish Army could beat the US Marines! The display was very well received and sparked some lively comments and questions. Many viewers, most of whom are long time militaria collectors of other eras and armies, noted that they had heard of the striped Spanish uniforms and straws hats worn in the colonies but had never seen them before. Most were surprised at the design and quality of the rayadillo uniforms that they had always assumed were nothing more than 'cheap pajamas'. 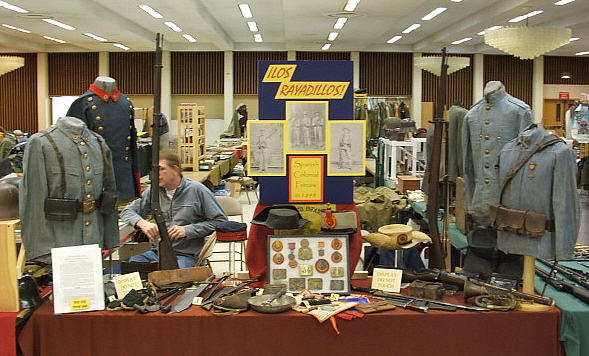 The display was a bit larger that the first one in Tennessee with the inclusion of several more variations of the Model 1843 machete, a knapsack and a Model 1892 Mauser Cavalry carbine. The concept of a reference book on the subject met with favor and several folks offered to share items from their collections for the project. The display also had desired affect of opening up the possibility of adding some new items to the collection. Several collectors recalled that they had a few Spanish souvenirs buried back at home that they would consider parting with and promised to be in touch with me. Needless to say, I am excited to see what turns up! Below is an overview of the display. I will post a separate web page of other photos from the display in the near future. ***On Campaign: I have recently learned of a small museum that holds a large collection of undocumented Spanish artifacts, all the souvenirs of one American soldier. I am told there is at least one uniform, several straw hats and a large amount of insignia, belt buckles, weapons, etc. I have made arrangements to document the entire collection this Spring. The inclusion of this collection in the book will be the first time that it will be generally available to collecting community for study. I am very excited at the prospect of studying this collection and adding the information to the project's growing resources. Naturally, readers of "The Tropical Telegraph" will get the first view of this important discovery. That's all for this time. ¡Adiós amigos! Welcome to the first posting of the "The Tropical Telegraph". In this newsletter I hope to keep all my fellow Rayadillo addicts apprised of the progress in the ongoing Spanish Colonial research project. I plan to include information on new finds, web page additions and research updates. It is here that you will meet some the other scholars that are helping with the project. Also, I will keep you informed when and where the ¡Los Rayadillos! display can be viewed at selected military collector shows. As you know, the end goal is the publication of quality, thorough reference book that will accurately cover the uniforms, headgear, insignia, equipment, weapons and personal effects of the Spanish colonial soldiers, volunteers, Civil Guards as well as other security and government forces that defended the 'Ultramar'. This may be a multi year adventure, so hang on and enjoy the ride! ***New Page: The "Hat Cockades and Badges" page is now up and running. Some nice examples if I do say so myself. ***¡Nuestro nuevo amigo! : I am very please to welcome Fernando Camareno to the project. Fernando has spent many years studying the Spanish colonial army and its uniforms. He is an encyclopedia of knowledge on the subject and has graciously agreed to assist. I look forward to a long, continued research and collecting friendship with Fernando.